There's not much to talk about regarding our newest club, but the announcement that NYC will finally be represented in MLS has drawn lots of attention from the design community. We have another concept crest, this one from Cláudio Cruz. Today I bring you my idea for the New York City FC, ​​a new team that will act in MLS from 2015, and born from the partnership between Manchester City and the New York Yankees. 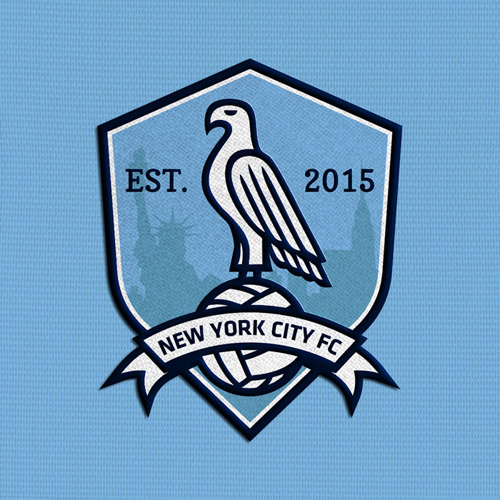 Regarding the emblem, used a format shield with an eagle on the inside, the idea of ​​using the eagle was due to the fact that the common element between Manchester City emblem and flag of the city of New York. This eagle appears white, resting on a soccer ball, which means precisely the sport where this emblem is used. Appear at the bottom of the emblem silhouettes of some buildings in the city of New York, including the Empire State Building (right), as well as the Statue of Liberty (left). Appears also a reference to the year of creation of the club, with the inscription EST. In 2015. 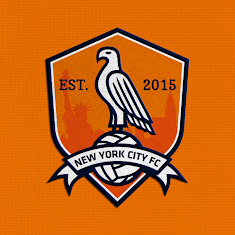 Finally, the name "New York City FC" appears in white band, thus completing the emblem. The emblem on the left, used as base colors, sky blue of Manchester City and the dark blue of the New York Yankees. The emblem of the Right, I used only the colors of the flag of the city of New York, which are dark blue, white and orange. Very nice. The sublimated buildings are a good way of bringing the city's landmarks without letting them overwhelm the design. I love the simple Deco bird - that would fit right in on the Chrysler Building. The bird-on-ball would also make a good secondary, if a bit Spurs-ish. Then again, a pigeon would be cool - "Pigeons" would be a good nickname for the team. What do you think? 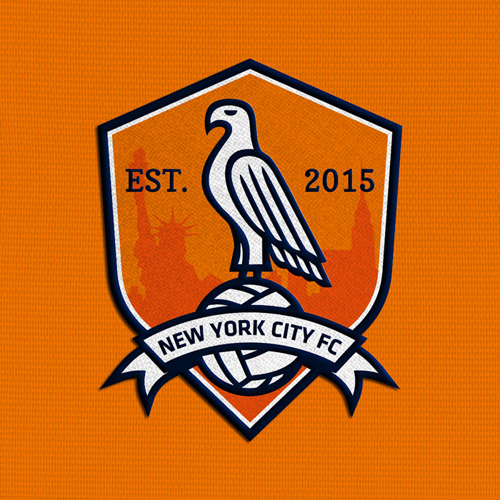 Would this be a fitting crest for the club? Thank you very much for displaying my crest concept, nice work with this blog!